4-CD Box (LP-Format) mit 83-seitigem Buch, CD 121 Einzeltitel, Spieldauer ca. 309 Minuten. DVD 11 Einzeltitel, Spieldauer ca. 23 Minuten. 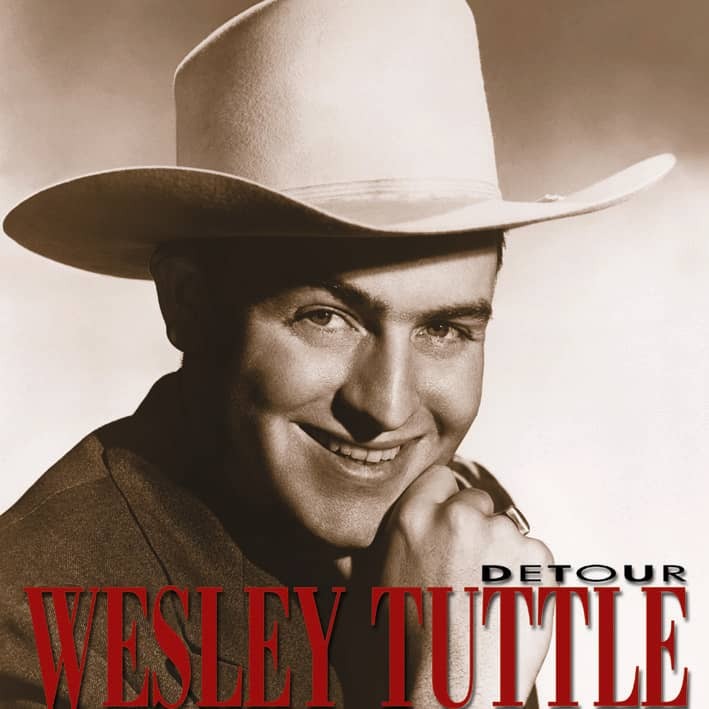 Wesley Tuttle ist leider einer der vergessenen Giganten der Country-Musik von der Westküste. 1944 war er erst der zweite Country-Interpret, der einen Vertrag bei Capitol erhielt; gleich seine zweite Platte, With Tears In My Eyes, kam im Jahr darauf auf Rang 1 der Country-Charts. Und innerhalb der nächsten sechs Monate gelangten Detour, I Wish I Had Never Met Sunshine und Tho’ I Tried (I Can’t Forget You) in die Top 5. Tex Ritter, Charles Starrett und Jimmy Wakely. 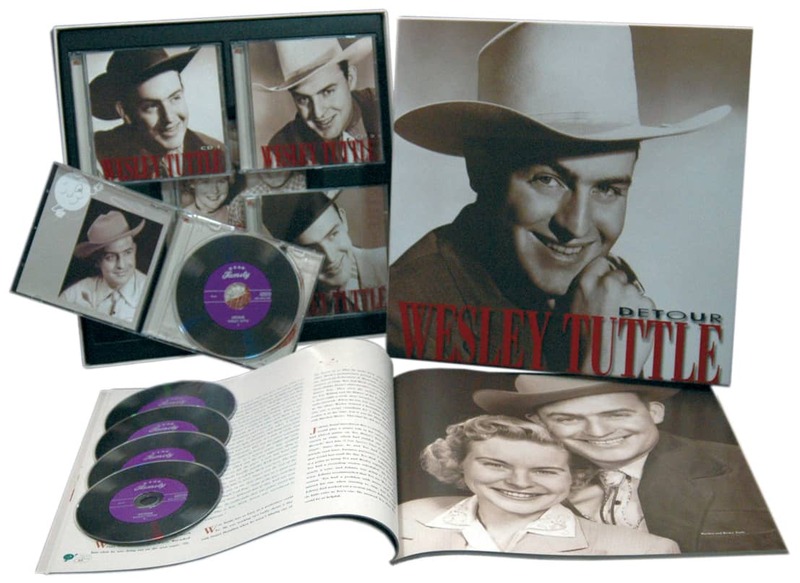 Diese längst überfällige Anthologie mit 4 CDs und einer DVD versammelt Wesley Tuttles Capitol-Aufnahmen und extrem seltene Radio-Transkriptionen. Die DVD enthält den Western 'Song Of The Sierras' mit Wesley Tuttle in einer Nebenrolle. Ebenfalls auf der DVD: mehrere Snader-Film-Transkriptionen, mit Songs wie Red River Valley, When Payday Rolls Around und Yodeling Boogie. Schon 1957 verabschiedete er sich von weltlicher Musik – was er bis dahin geleistet hat, verschafft ihm einen Platz unter den ganz Großen sowohl in der Country- wie auch in der Western-Musik. Diese exklusive Box enthält auch eine neu recherchierte Biographie von Packy Smith, eine Komplett-Discographie und viele bislang unpublizierte Fotos. 03 Who Do You Spend Your Dreams With? In early 1957, William Wagnon, Jr., the producer of the very popular Los Angeles television program 'Town Hall Party,' drove out to the small town of San Fernando to visit with Wesley and Marilyn Tuttle. The purpose of his trip was to try to convince the Tuttles to join his newest venture, a spin-off of the 'Town Hall Party' to be called 'Ranch Party.' A few months earlier, Wesley and Marilyn had quit 'Town Hall Party' in protest over its direction. Deeply religious, the Tuttles were not fans of the new rock 'n' roll music that was beginning to dominate the airwaves and were unhappy with what they perceived as a shift away from the Country and Western music that had been the heart of the show up to that time. Also, they were disappointed that a beer distributor had become one of the show's major sponsors. 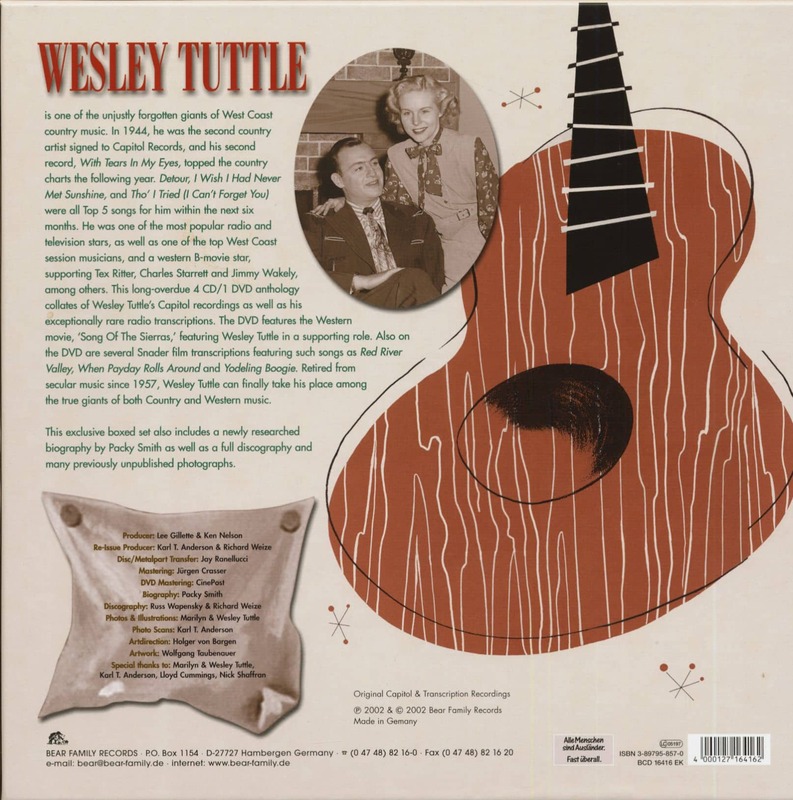 Although not yet forty years old, Wesley Tuttle had been a major figure in the West Coast country music scene for over twenty-five years and Bill Wagnon knew he would be a valuable asset to his new program. For the preceding five years Wes and Marilyn had not only been featured performers on 'Town Hall Party,' Wesley had also served as the musical director of the show, a task Wagnon was hoping to convince him to accept for 'Ranch Party.' An agreement was finally reached that would make Wesley and Marilyn Tuttle regular performers and Wes the musical director of 'Ranch Party.' It was the last job in the secular music business that Wesley Tuttle would hold. 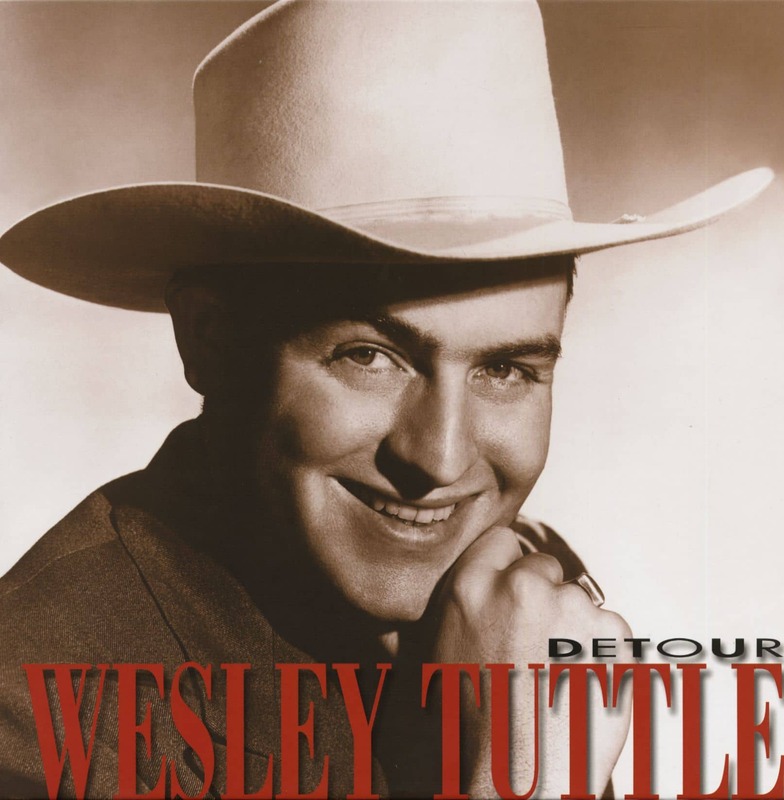 Shortly after completing the thirty-nine shows, Wesley began studying at Pacific Bible Seminary, devoting the rest of his musical career to the Christian Ministry. One of the true pioneers of country music radio and a significant performer during the formative years of the West Coast country music scene walked away from a successful career and has nearly been lost to history. Wesley Tuttle has been identified with Los Angeles and the San Fernando Valley for nearly eighty years and many assume that he was born there. However, he was born in a small southeastern Colorado town about thirty miles from the Kansas State line. His mother and father met in a tiny restaurant in the town of Lamar. Erma Stokesberry, a teenager, was a waitress in the café where Charles Van Ransler Tuttle was the cook. At nearly five-foot-eleven inches tall, easily three inches taller than Charlie, Erma did not like the cocky 'older man' at first. Described as 'feisty' and 'certainly not shy' by some, as well as 'self-confident' and 'self-reliant' by others, Charlie did prove to be a hard worker and good provider. After the initial period of disdain, Wes says his mother told him "… finally, he got so cute, I had to marry him." After they were married, Charlie and Erma moved into the front bedroom of her parents’ home. It was there on Sunday, December 30, 1917, Wesley LeRoy Tuttle was born. Both parents continued to work at the restaurant, with Erma's mother taking care of the baby. As Wes got older his parents would occasionally take him to work with them. In the café there was a phonograph in the dining area. At that time this was a common practice in small towns where very few people had either radios or record players. According to Wesley, at a very young age, even before he could say the words, he would climb up on a stool beside the phonograph and sing in harmony with the record. He didn't say the words, but would sing da da dah, da dah. He also had the good fortune to have both parents who were good singers and sang for their own enjoyment. When Wesley was three, his grandmother moved to Pueblo, Colorado, about 90 miles from Lamar. While his father stayed for a few weeks to work in the restaurant, Wesley and Erma went with her mother. After working long enough to save the money to buy a 1917 Model T, Charlie came to Pueblo to join Erma and Wesley. It was shortly after Charlie arrived that they set out for California where they had family in San Fernando, a little town northwest of Los Angeles. Kundenbewertungen für "Detour (4-CD & 1-DVD mit 83-seitigem Buch)"